March 30, 1867 - Secretary of State William H. Seward consummates the sale of Alaska to the United States from Russia for $7.2 million dollars, approximately two cents per acre, by signing the Treaty of Cession of Russian America to the United States. There had been consternation between the various parties who wanted to control Alaska for decades, whether it be the natives versus the Russian traders, the British and their conquest of Canada, or the United States. 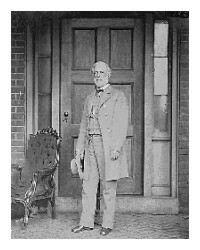 By 1867, that consternation would turn into a somewhat surprising development, when William H. Seward, the United States Secretary of State, would consummate a sale of three hundred and sixty million acres of territory and add it to the inventory of the emerging power to the south. No, he didn't know that oil would abound beneath its tundra. No, the Russians didn't realize that it would be a blunder of gargatuan proportions as the decades and centuries would meander forward. But at first it was not oil that brewed that blunder. Just think how mad the Russians were when the Klondike Gold Rush hit in 1896. And yes, for all those reasons and more, Vladimir Putin likely rues the sale of Russian America to this day. 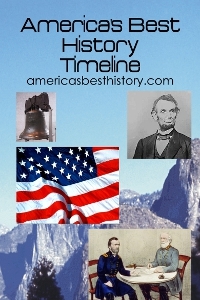 A frontier treaty had been signed in 1824, the Russo American Treaty, cementing the boundaries of the territories that Great Britain, with Canada, the United States, with Oregon and Washington, and Russia, with the large Alaskan territory, would claim. That did not correct all boundary issues, and as the decades pressed further, it became apparent that the status quo would not remain. Desire to purchase Alaska by the United States spiked during the Buchanan administration, but the Civil War intervened. Once that was over, the desire to add twenty percent more acreage to the United States was once again on. Secretary of State Seward was a big proponent, as was President Andrew Johnson, but not all in the government agreed. Critics dubbed the idea "Seward's Folly" or "Johnson's Polar Bear Garden." So why did Russia want to do this? The Tsar had just lost a war with Great Britain, the Crimean War, and had huge debts to pay off. They were also afraid that if war broke out with Great Britain again, particularly on the frontier between Canada and Russian Alaska, that they would not win. 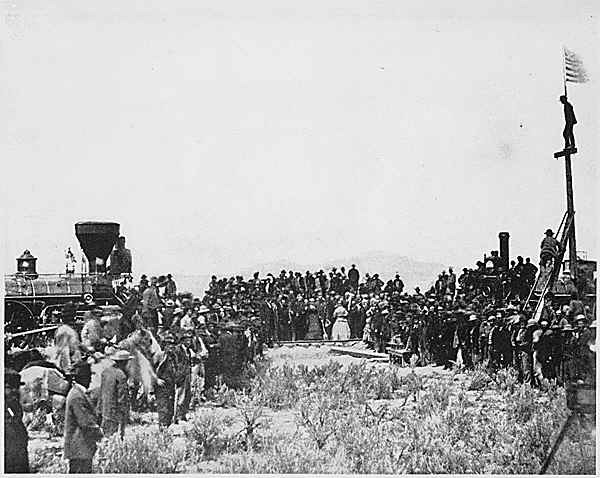 The Tsar, Alexander II, and Russian representatives, realized that there was value in the territory, even a potential gold strike after gold had been found in California. But they also knew that if that happened, their ability to withstand the onslaught of Canadian and American miners in their territory would outpace any Russian presence. 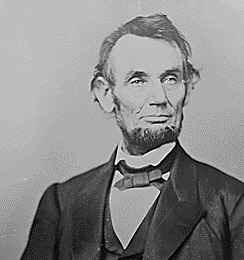 Russia approached both the United States and Great Britain during the late 1850's, but Great Britain showed little interest. 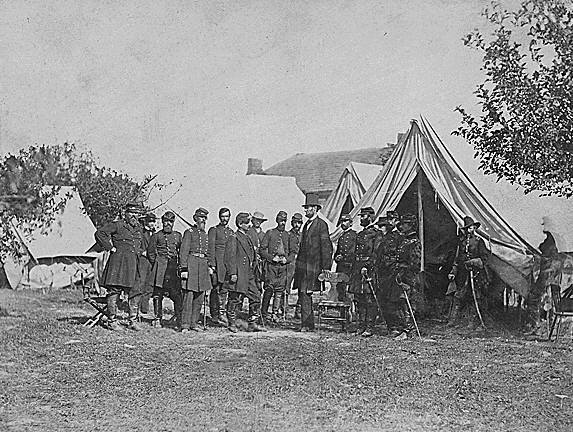 The Americans were intrigued, but had more pressing issues with the Civil War after they were approached in 1859. But Russia continued to press the issue, in part in an attempt to weaken the British. After the Civil War ended, the Tsar instructed his Russian representative, Eduard de Stoeckl, to approach the United States again with a proposed sale in March 1867. Within one month, the sale had been negotiated. Although it has been commonly thought that the sale was not popular with the citizens of the United States, that sentiment in now thought inaccurate by most scholars. Russia handed over its territory in a ceremony in Sitka on October 18, 1867. Washington, March 31. - The President haa communicated to the Senate, in its Executive Session, a treaty with Russia by which that power surrenders to the United States its sovereignty over all of Russian America and the adjacent islands. It especially includes the strip 400 miles long, which extends down the coast, thus excluding British America from the Ocean. The Treaty was laid on the table, and will be taken up next week. The Treaty was concluded between the Secretary of State, on behalf of the President of the United States and the Russian representatives, on behalf of the Emperor of Russia. The Russian Government agrees to convey to the United States Government all its possessions on the American Continent, known as Russian America, in consideration of the payment of $7,000,000. The negotiation was discussed at a Cabinet meeting on Friday night. The Russian Minister afterward visited the State Department to arrange the terms, and at an early hour on Saturday morning the arrangement was definitely perfected. The English representatives here are deeply chagrined, and it is said that Sir Frederick Bruce will telegraph to Earl Derby for instructions to protest against its acceptance by our Government. This acquisition more than doubles the United States coast on the Pacific, which now extends from Lower California to Behring's Straits, with the exception of the narrow strip comprising British Colombia. The area ceded by Russia comprises the whole of the Continent of North America west of Longitude 141 degrees. It is bounded by British America and the Pacific and Arctic Oceans. It includes a great number of islands, and is of the highest importance as a naval depot, and for strategic purposes. It is a valuable fur country, and embraces a vast section of territory, the possession of which will influence in our favor the vast trade of the Pacific. The purchased territory covers upwards of 400,000 square miles, and contains about 60,000 inhabitants, half of whom are Esquimaux. The fisheries are very extensive, but the principal commercial wealth of the country is in its fur trade, which would, henceforth, be altogether controlled by American merchants. The aquisition of this territory would give our Government control of the Russian American telegraph, in case the work should be completed. March 30, 1867 - Treaty concerning the Cession of the Russian Possessions in North America by his Majesty the Emperor of all the Russias to the United States of America; Concluded March 30, 1867; Ratified by the United States May 28, 1867; Exchanged June 20, 1867; Proclaimed by the United States June 20, 1867. The United States of America and His Majesty the Emperor of all the Russias, being desirous of strengthening, if possible, the good understanding which exists between them, have, for that purpose, appointed as their Plenipotentiaries: the President of the United States, William H. Seward, Secretary of State; and His Majesty the Emperor of all the Russias, the Privy Councillor Edward de Stoeckl, his Envoy Extraordinary and Minister Plenipotentiary to the United States. ARTICLE II. 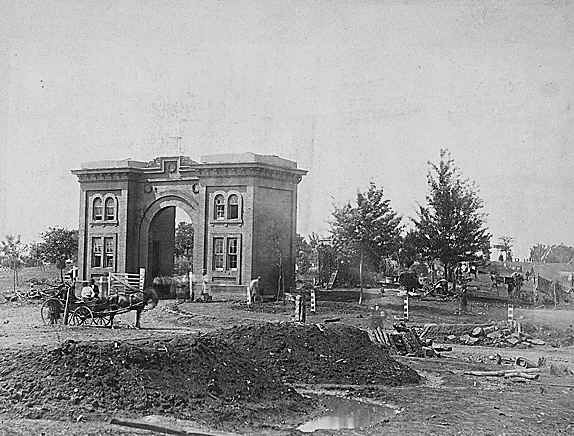 - In the cession of territory and dominion made by the preceding article are included the right of property in all public lots and squares, vacant lands, and all public buildings, fortifications, barracks, and other edifices which are not private individual property. It is, however, understood and agreed, that the churches which have been built in the ceded territory by the Russian government, shall remain the property of such members of the Greek Oriental Church resident in the territory, as may choose to worship therein. Any government archives, papers, and documents relative to the territory and dominion aforesaid, which may be now existing there, will be left in the possession of the agent of the United States; but an authenticated copy of such of them as may be required, will be, at all times, given by the United States to the Russian government, or to such Russian officers or subjects as they may apply for. ARTICLE III. 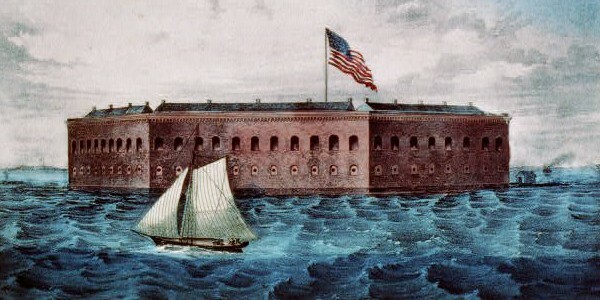 - The inhabitants of the ceded territory, according to their choice, reserving their natural allegiance, may return to Russia within three years; but if they should prefer to remain in the ceded territory, they, with the exception of uncivilized native tribes, shall be admitted to the enjoyment of all the rights, advantages, and immunities of citizens of the United States, and shall be maintained and protected in the free enjoyment of their liberty, property, and religion. 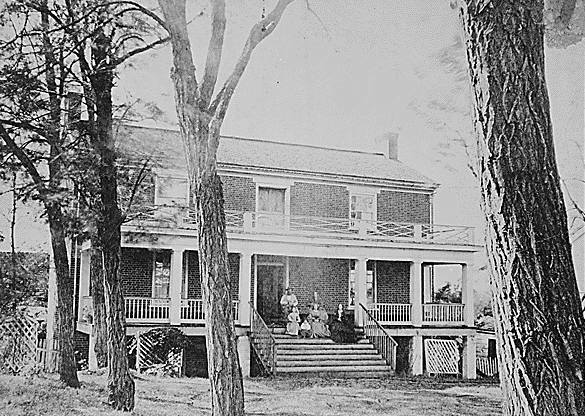 The uncivilized tribes will be subject to such laws and regulations as the United States may, from time to time, adopt in regard to aboriginal tribes of that country. ARTICLE IV. - His Majesty the Emperor of all the Russias shall appoint, with convenient despatch, an agent or agents for the purpose of formally delivering to a similar agent or agents appointed on behalf of the United States, the territory, dominion, property, dependencies and appurtenances which are ceded as above, and for doing any other act which may be necessary in regard thereto. But the cession, with the right of immediate possession, is nevertheless to be deemed complete and absolute on the exchange of ratifications, without waiting for such formal delivery. ARTICLE V. - Immediately after the exchange of the ratifications of this convention, any fortifications or military posts which may be in the ceded territory shall be delivered to the agent of the United States, and any Russian troops which may be in the territory shall be withdrawn as soon as may be reasonably and conveniently practicable. ARTICLE VI. - In consideration of the cession aforesaid, the United States agree to pay at the treasury in Washington, within ten months after the exchange of the ratifications of this convention, to the diplomatic representative or other agent of his Majesty the Emperor of all the Russias, duly authorized to receive the same, seven million two hundred thousand dollars in gold. The cession of territory and dominion herein made is hereby declared to be free and unencumbered by any reservations, privileges, franchises, grants, or possessions, by any associated companies, whether corporate or incorporate, Russian or any other, or by any parties, except merely private individual property holders; and the cession hereby made, conveys all the rights, franchises, and privileges now belonging to Russia in the said territory or dominion, and appurtenances thereto. ARTICLE VII. - When this convention shall have been duly ratified by the President of the United States, by and with the advice and consent of the Senate, on the one part, and on the other by his Majesty the Emperor of all the Russias, the ratifications shall be exchanged at Washington within three months from the date hereof, or sooner if possible. 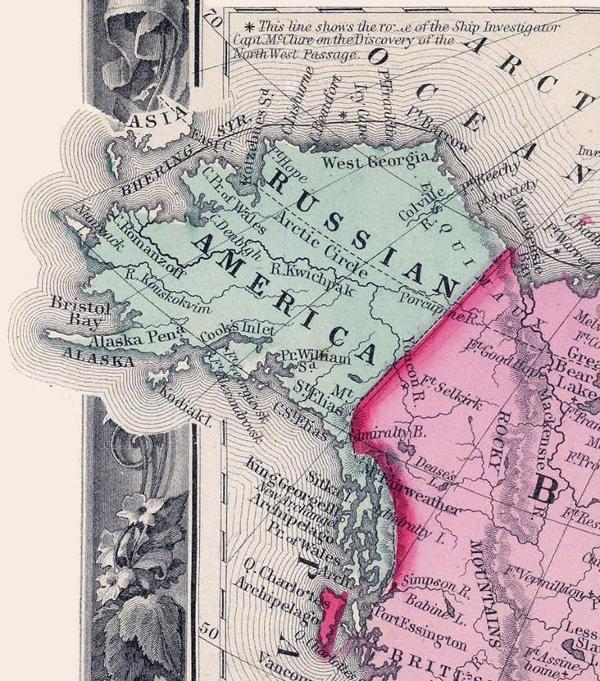 Image above: Russian American border 1860, 1860, Map of North America, Mitchell's New General Atlas, S. Augustus Mitchell. Courtesy Wikipedia Commons. Image below: Signing of the Treaty of Cession, 1867, Emanuel Leutze. Courtesy Alaska Humanities Forum via Wikipedia Commons. 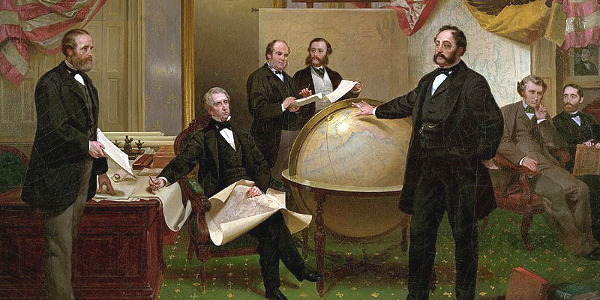 Pictured left to right in the painting are Robert Chew, William H. Seward, William Hunter, Mr. Bodisco, Russian Ambassador Baron de Stoeckl, Charles Sumner, and Fredrick W. Seward. Info source: Avalon Project, Documents of Law, History, and Diplomacy, Yale Law School; Library of Congress; New York Tribune; Wikipedia Commons.